This week’s review takes me back to the Balti Triangle and Kafe Karachi which has gone through more brand makeovers than any your average restuarant on the Ladypool Road. This is the first blog where I have managed to remember to take photos with my Nokia E71 which in my humble opinion is one of the best Nokia phones ever produced. Its the Nokia take on a Blackberry albeit on the much slimmer side with a full qwerty keyboard. If I have one criticism of my beloved E71 its the camera so I hope the photos come out well! On a side note, we’ve had a great response from readers wanting to contribute reviews to the website, inshallah over the next few months we fully expect reviews to go live in London, Manchester, Cardiff, Bradford and other cities. Back to Kafe Karachi which is supporting a brand new look both on the outside and the inside, gone is the tacky yellow sign and the diner style seating and tables both of which have been replaced with a sleek black and yellow branding that definitely is more welcoming than before. Customers can use the Kafe Karachi car park at the back of the restuarant which is a significant advantage to some of the other restaurants in the area where car parking is at a premium and road rage is a way of life! Entering into Kafe Karachi and the first thing that hits you is the new furniture, I have a feeling they got a bulk discount on their purchase of tables and chairs. Failing that they must be going for a world record bid of trying to fit in as many covers in to their dining space as possible. I wouldn’t want to be eating in Kafe Karachi on a busy night! Kafe Karachi falls into the same category as Lahore Kebab House in the sense both serve the purpose of providing you with a fast food balti and kebab dining experience. You have the opportunity to relax and eat your meal in your own time but don’t expect any fancy extra. On the other hand I have to say I was surprised by the coordinated yellow napkins that were on each table maybe they are going for that Michelin dining experience after all! With a full window frontage there is plenty of light coming into Kafe Karachi with two flatscreen tv screens at each end of the restaurant providing an entertainment option. Last week at Krahi King we were subjected to the Pakistani equivalent of X Factor with a religious twist, the WWE wrestling at Kafe Karachi was much more to my liking! To balance out the WWE effect which coincidentally has gone PG ( wrestling geek coming out! ) Kafe Karachi has adorned its wall with religious imagery of various mosques from the Muslim World. Our trip to Kafe Karachi coincided with a late lunch so we didn’t indulge in the same manner we did at the boys night out at Kafe Karahi which by the way was a riot! 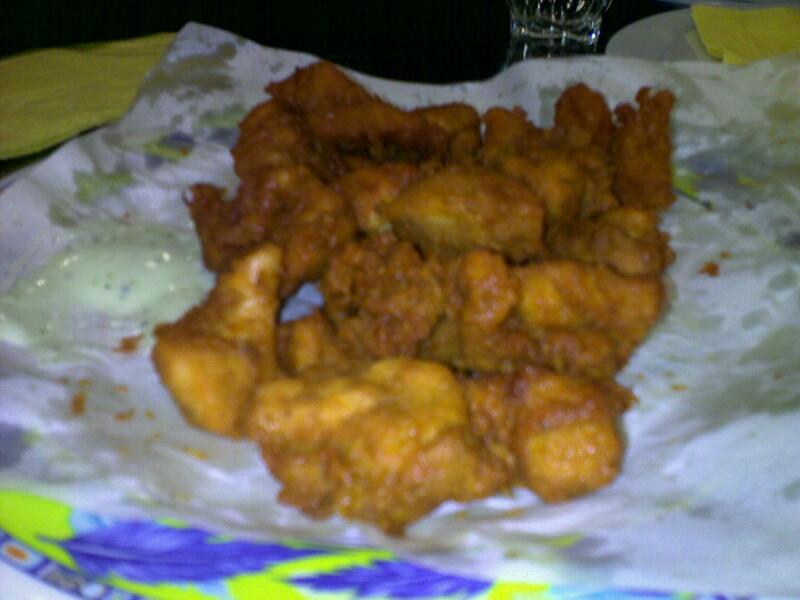 For starters we stuck to a portion of chicken pakora which seems to be my starter of choice. I think I need to diversify my selections for future reviews! The chicken pakora was not up to the standard of my Mushtaq chicken pakora benchmark but it was ok. I’m still waiting for a chicken pakora to blow me away I don’t think its going to happen just yet. For our mains we had a mix of a Patera balti with rotis and nan, grilled chicken, masala fish, sheesh kebabs and fries. One of my reservations about places like Kafe Karachi and Lahore Kebab House is the pre prepared baltis. I understand the rationale for this from a fast food and convenience perspective but it flags up a red alert to my stomach which refuses to order a balti that has been sittting in the counter for any number of hours or god forbid days! Luckily one of my fellow diners was a lot braver than me but he has spent time in the roughest terrains and localities in the world in his role as relief worker! The Patera balti which is a popular alternative to chicken can be described in one word SALTY! The Patera itself was well cooked, the meat tender and coming off the bone but the balti itself was spoiled by too much salt. 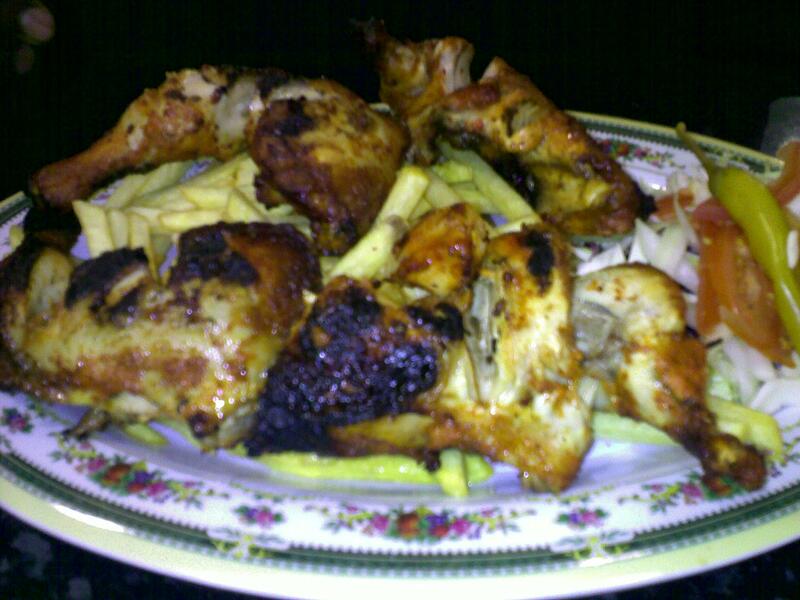 The full grilled chicken received a much more favourable response, it was well cooked and well seasoned. Judging by the pile of bones at the end of the meal I can only assume my fellow diners had no complaints though both felt the portion of fries was far too dry. Birmingham is the home of the Masala fish and when we have hosted Artists, Imams and Film Makers from around the world we always make sure they try the Masala fish. I’ve reviewed the humble Masala fish in a number of my reviews to date and I am pleased to say Kafe Karachi delivers a great Masala fish and matching the standards experienced at Desi Express and Krahi King. The sheesh kebabs were ok but not on a par with the delightful sheesh kebabs we had last week at Krahi King. To finish off the meal we had some desi tea and Jalebi. Kafe Karachi succeeded where Krahi King failed and served their tea in cups with no stains or spills, though I have to say the sugar pot and spoon have seen better days! The Jalebi was ok it was served warm but I fear that was more courtesy of a dose of radiation in the microwave than it coming fresh from the cooker. Microwaved Jalebi doesn’t do it for me but I have to confess I prefer my Jalebi cold and crispy and not warm and oozy. In terms of service and price Karachi King delivers, prices are competitive and the service was quick. The restuarant has a relaxed atmosphere and it was evident that a lot of the diners were regulars as there was lots of good natured banter between the staff and customers. To sum Karachi King up its very similar to the offer at Lahore Kebab House down the road. The menu options are very similar as are prices. What scares me about the similarity is the lack of diversity in the food offer surely Karachi and Lahori cuisine can’t be so similar. 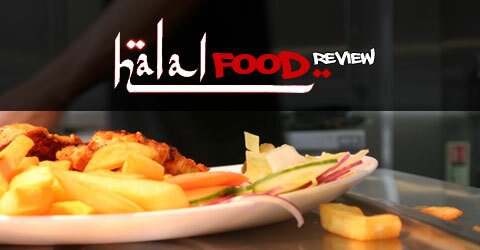 The Halal Food Review is looking for reviewers to join our team from across the UK. If you are passionate about food and prepared to put your thoughts online then we want to hear from you. We are especially looking for reviewers from outside of Birmingham to join the team to help take our reviews National. Salaams and greetings to the blogosphere! Over the last few weeks I’ve been pleasantly surprised by how many people are following the blog and how much they are enjoying it. Please do keep your feedback coming both positive and constructive! This week I’ve reverted back to life as a bachelor while the wife and kids have packed their bags and I do mean BAGS for a week at the in-laws. A bachelor week wouldn’t be complete without a night out with the guys so a group of the great and the good joined me for a bite to eat. Our original plan to visit Desi Khana Grill on the Ladypool Road fell through as we arrived to the sight of shutters down which is never a good sign for a Balti restuarant and sets your mind wondering on why the shutters are down! It turned out to be a blessing in disguise as our band of the great and the good were agreeing to disagree on whether or not to eat there in the first place. 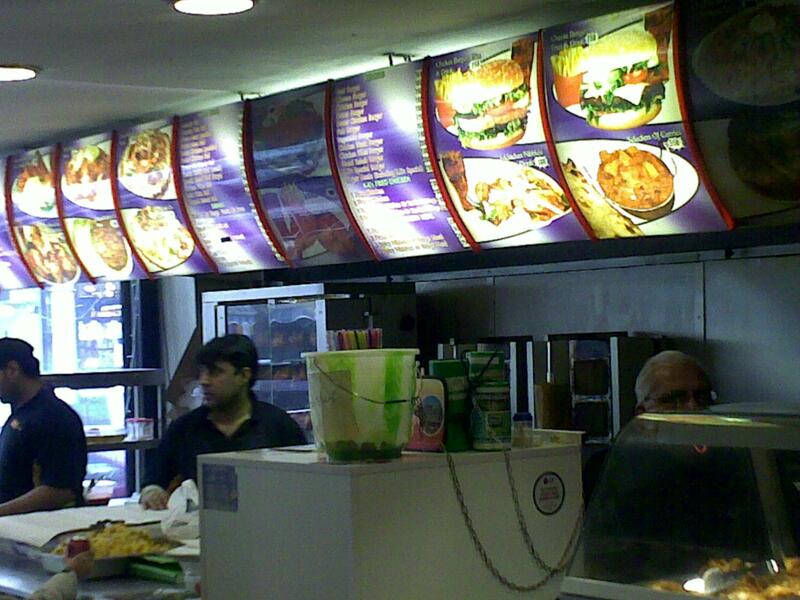 An executive decision had to be made so we opted for Krahi King on the Coventry Road. Krahi King is located at the Morrisons end of Coventry Road and comes with standard bright neon lettering letting you know in no uncertain terms what the name of the establishment is. For anyone of a nervous disposition be prepared for a shock when you walk into Krahi King this is one place which definitely does not pride itself on its décor. The walls need a good lick of paint, there are holes in the wall and I’ll stop right there! The restaurant is split over two floors with a family dining area located upstairs. The downstairs seating area entrance is dominated by the counter, grills and tandoor where all the starters, rotis and kebabs are prepared. The dining area is long and narrow and this does cause problems for large dining parties. We arrived shortly after 7pm and had to rearrange the furniture to seat 7 people at one table. Once we sat down we experienced air conditioning Small Heath style, an open window at the front of the restuarant sent a draft right up us faster than Corporal Jones could stick his bayonet up a German soldier! For entertainment the restuarant has a flat screen television which pumps out the latest Urdu naats from the endless parade of 3rd rate television channels that dominate the Sky listings when you hit the 800s! Having survived the décor, recovered from Corporal Jones’s icy blast and blocking out the entertainment we were ready to order starters. Our dining experience began with a waiter who refused to write anything down, he will now be known as the memory waiter who calmly reassured us he did not need a pen and paper despite our pleas that he should get a pen and paper. For starters we ordered a large mixed grill, sheesh kebabs, chicken pakoras, lamb chop sizzlers, masala fish and fries. Our starters took a while to arrive but we were provided with mint sauce on saucers and an ample supply of salad to occupy our gaze and stomachs. Not wishing to be picky but I don’t want my mint sauce arriving on saucers, stick it in a proper serving dish or in a squeezy bottle but please don’t put it in a tea cup saucer! After a slight wait our starters finally arrived and our memory waiter had not let us down he delivered everything that was ordered. The sheesh kebabs were the undoubted standout option from the starter menu. Having sampled the best and worst of sheesh kebabs and koftas all over Birmingham I think you would have to go a long long way to find better sheesh kebabs than King Krahi. The portions are generous, there is a spicy kick to the sheesh kebabs and they are not burnt to a crisp or completely undercooked as can be the case in certain kebab houses across the city. The masala fish was not far behind, the fish was cooked to perfection and had the right mix of masala so as to not drown the taste of the fish. The mixed grill also lived up to expectations with a mix of sheesh kebabs, lamb chops, chicken tikka and lamb tikka. The chicken pakora was standard fare and the only really disappointing starter was the lamb sizzler which failed to keep up with the high standards of the other starters. Before I review the mains its worth noting that Krahi King was extremely busy when we arrived which caught us slightly by surprise for a Wednesday evening. The majority of diners were of Pakistani origin. The restuarant has a real desi feel to it and seeing so many Pakistani diners including elders is always a good sign when it comes to judging the quality of food. The locals are the most demanding when it comes to baltis and tend to eat where the food is most authentic. 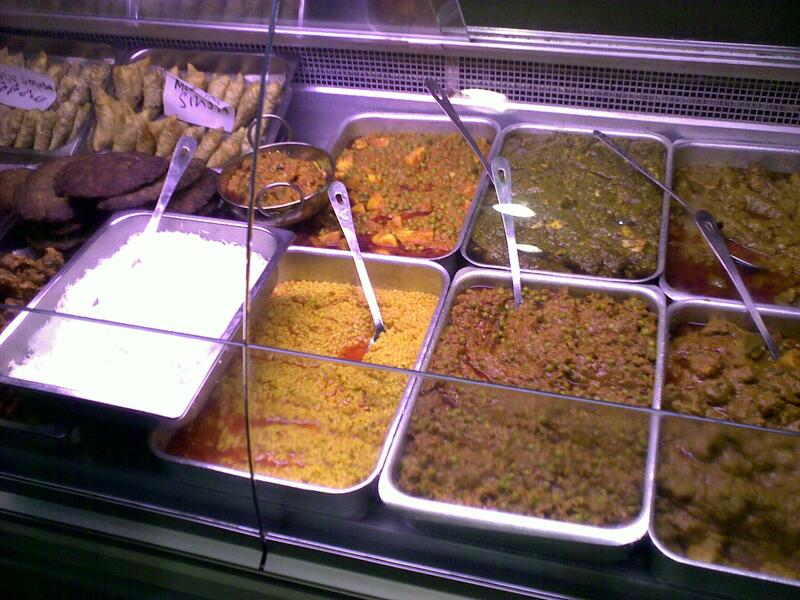 For our mains we ordered the chicken saag, chicken, lamb and keema baltis with traditional rotis. If the starters had set a high standard then the mains raised the bar even further. All four balti dishes hit the spot. The lamb and the chicken were cooked to perfection with both meats literally melting on the tongue. The chicken saag was as good as any home cooked meal I’ve experienced. Keema baltis can be a hit and miss affair but it was a winner at Krahi King and narrowly pipped the other three baltis to the post to the crown of best main dish on the night. The rotis continued to come fresh off the tandoor and made for a relaxed and pleasant dining experience. The beauty of the balti and karahi dishes in particular can be put down to the fact they are freshly prepared and you can taste the different flavours unlike rival restaurants which often have their balti and karahi dishes preprepared. Service on the night was erratic but in all honesty in an establishment like Krahi King the erratic nature of the service adds to its charms. If you choose to dine at Krahi King you are coming here for the food and the food is as good if not better than any restuarant I have reviewed in the short history of this blog. If you want suited and uniformed waiters, posh cutlery, plates of food that resemble works of art and a price to match then you’re better off looking elsewhere and settling for superior surroundings and most probably inferior food. I’d urge any reader to look beyond the tatty walls, brave the open windows and put up with the latest naats and temperamental service to experience some of the best and most authentic Kashmiri / Pakistani food in the city. No trip to Krahi King is complete without a cup of desi chai to wash down your meal. True to form the chai comes in cups that have seen better days, with spill marks adourning the cup but credit where its due the tea is excellent! The consensus around the table was extremely positive, one of our diners admitted when he first walked in he wasn’t expecting a classic but he was positively surprised by the quality of food he experienced. Price wise the restaurant is an absolute bargain, the karahi dishes are delicious and significantly cheaper than similar options in the Balti belt. A group of seven can eat like kings and queens for well under a tenner per head. We had minor quibbles over the availability and serving of the various condiments, some of the starters didn’t match the fish and kebabs but all in all it was a wonderful experience. A word of caution to anyone thinking of going to Krahi King for a romantic meal DON’T. Krahi King will do your love life no favours but if you want a good night out with the boys or want to treat the family to good desi food Krahi King ticks all the boxes. Its been a few weeks since I have had a chance to update the blog. On the 2nd January 2010 Allah SWT blessed me and the missus with a beautiful baby girl so its been more a case of nappies and baby feeds than fine dining. I did manage to escape the house to have enjoy an evening of great art and great company this past week when I went to see the Writing on the Wall show at the Birmingham Rep. Now in my other life I work in the arts and I have to say when it comes to Muslim arts scene I have been tempted to start a blog but I get more enjoyment out of food but never say never. Post show I joined the cast and crew for a bite to eat at one of the newer eating destinations on the Ladypool Road Desi Express. Desi Express replaced the Al Faisals Italian restaurant which never managed to live up to expectations perhaps a case of wrong location and wrong pricing or a combination of both. For the true Al Faisals experience I would highly recommend making the short hop to Stoney Lane where the original Al Faisals remains the premier halal balti house in the city. Gone is the signature chic black frontage of Al Faisals, diners are now greeted with a blinding Orange frontage which definitely captures your attention. If the proprietors were hoping to turn heads they definitely did! The restaurant is located in the heart of the Ladypool Road Balti district and retains the same interior of the old Italian establishment albeit with a lick of new paint and a some Lollywood memorabilia thrown in for good measure including a lovely reminder of the epic Lollywood classic Maula Jat a must for anyone wanting to experience the very best and worst of Pakistani film! We arrived at Desi Express towards the end of the evening, our dining party consisted of 11 people once somebody remembered to pick Amir Sulaiman up from his hotel in the city centre. The benefits of dining in a larger party is the opportunity to sample a better variety of dining options to give you a more informed viewpoint that takes into account different tastes and diner preferences. In our dining party we had vegetarians, an Aussie who simply doesn’t do spices as well as artists infamous for their appetite! 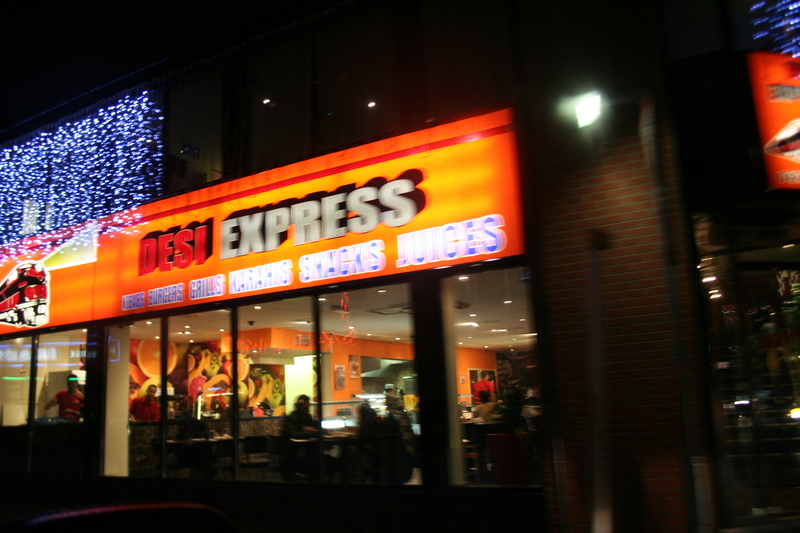 Desi Express has a simple menu comprising of classic kebab dishes, chicken options, masala fish as well as the traditional balti and biriyani options. The extra options on the menu include a number of steak options and remnants of the old Italian menu all adding up to an eclectic mix that gives you part kebab house, part steak house and part italian dining. The starters of choice across the table were the half chicken option, sheekh kebab and masala fish which was definitely the unanimous winner. Service was prompt helped by the restaurant winding down for the evening and our starters arrived promptly. The masala fish was excellent as was the half chicken both of which were generous sized portions that could easily serve as main options. Having eaten at Desi Express on a number of occasions I have noticed there is an excellent consistency to the food. The masala fish and the chicken starter definitely exceeded expectations and excelled in comparison to local competitors including Lahore where the Masala fish is as temperamental as the service excellent one moment and frustrating the next. For mains the table ordered a selection of chicken and vegetable biriyanis, tagliatelli with chicken in a mushroom and cheese sauce, ghost bhuna, a daal dish and some chicken balti with rice. Again the service was prompt, portion sizes were adequate and the food hit the mark. The tagliatelli was creamy and the bhuna ghost was mild but managed to sneak in a tangy bite. Both the chicken biriyani and vegetable biriyani portions were generous and following equally generous starter portions meant that two of our guests took home a doggy bag for later consumption. I have to give shout outs to the Mango Lassi which has to be the drink of choice to accompany any balti eating experience and it was great to see that Desi Express has maintained and transferred the quality and standard of the Mango Lassi from Al Faisals to the new establishment. Price wise the menu is affordable and a group of 11 people managed to eat and drink for well under £100 whilst ordering a variety of dishes and drinks throughout the evening. 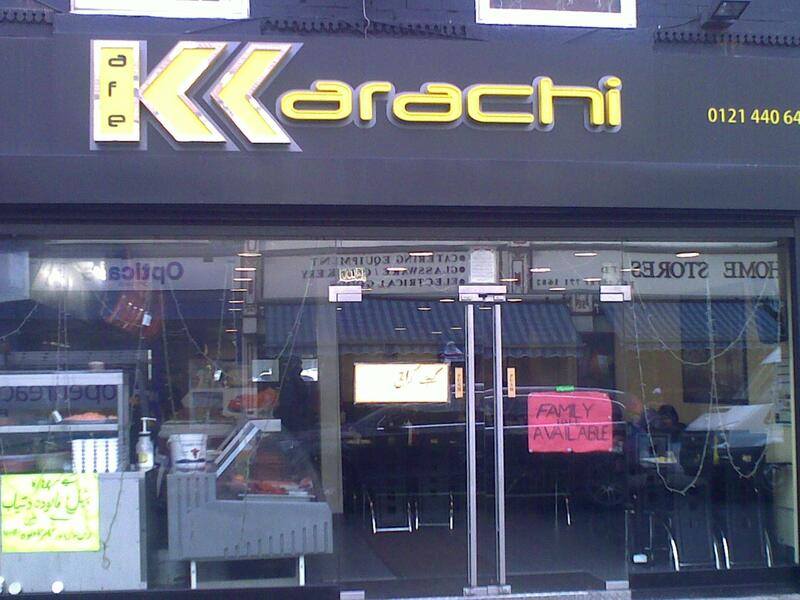 Prices are competitive considering the main rivals on Ladypool Road are ZamZams and Lahore Kebab House. Where Desi Express steals a march on its erstwhile rivals is the quality of the space which is light, airy and a welcome change from the dreary and drab surroundings of other establishments. One thing that does strike me about Desi Express is that I’m never sure whether its a dining destination or a place to grab a quick bite to eat and go. It bizarrely manages to fuse a traditional dining experience with the experience of sitting in a diner where you don’t want to overstay but in a weird way the halfway house hybrid model works for me. I’m equally comfortable eating at Desi Express with the family as I am relaxing with friends and the boys. If you’re looking for fine dining, head for Al Faisals on Stoney Lane, if you want cheap and cheerful a term new to our Aussie friend Desi Express is the place to go without compromising on quality. Having sampled the delights and at times pitfalls of Arabic and Pakistani cuisine in the past fortnight I thought it might be time to try some Bangladeshi inspired food. My timing as always was impeccable and I’ve chosen to review Mishtidesh the very week it launched its new buffet offer. Now we all know Muslims love their food and we love our food more when we hear the magic word BUFFET! So some background information on Mishtidesh. I have to confess I’m not an expert on Bangla cuisine or the scene in Birmingham but I sampled Mishtidesh in the company of two Bangladeshi friends both of whom have worked in the trade. To add to the ethnic mix of our trip we were joined by friends repping the Afro Caribbean and Irish communities. Mishtidesh is best known for its sweet centre and catering service for weddings and functions. From a sweet centre perspective I guess its to the Bangladeshi community what Ambala and Mushtaqs are to the Pakistani community. I was reliably informed this was the second attempt to relaunch Mishtidesh as a dining destination the previous attempt didn’t fare to well and the buffet marked a return to a more traditional style of Bangladeshi cuisine that lends itself to home cooked favourites rather than High street dishes. 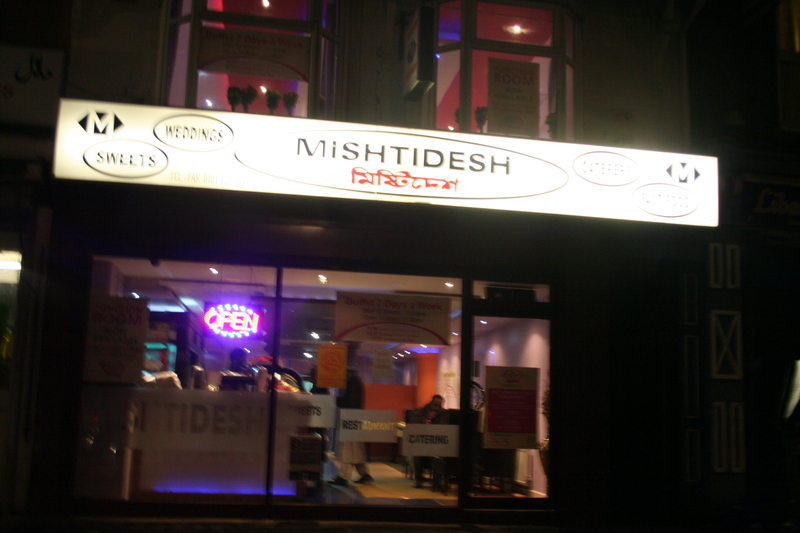 Mishtidesh is located on the Coventry Road in the Small Heath area of the city opposite the well established Dar Ul Loom mosque or the Bangladeshi mosque as its better known in the city. From the outside there is nothing spectacular about Mishtidesh its a standard retail outlet with a strong emphasis on its sweet offer. Inside the restaurant the decore is clean, simple and welcoming. You do get a feeling they have tried to cram as many covers into the downstairs space as possible especially around the front of the space where you are likely to have takeaway customers becoming more intimate with your table than you would like! Towards the back of the dining area there are a couple of booths which are designed for family diners, again these were a tight fit especially with the guests we had around the table! As with our previous reviews we arrived just after Friday prayers to find the buffet being set up, our nervousness at seeing a few dishes was quickly replaced with the enthusiasm you expect Muslims to have at the mention of a buffet as more dishes arrived out of the kitchen area albeit in a slow and disordered way! For my first trip to the buffet counter I topped up my plate with vegetable pakoras, some potatoes, what I can best describe as round sheesh kebab mini balls, some salad and spring rolls. At this stage we were still crying out for some sauces which thankfully arrived in the form of mint and chilli sauce. The starters were a mixed affair, the pakoras were good albeit a bit on the cold side, the spring rolls were more pastry than filling and the salad was a flood of lettuce with the odd tomatoe and cucumber hiding in the undergrowth of lettuce. The star of the starters were the sheekh kebab balls which were spicy, tender and simply delicious! For my mains I had a mixture of pilau rice, keema, chicken balti, cauliflower and potatoe balti and a fish curry coupled with a few more kebab balls for good measure! This for me is the beauty of any buffet the wonderful ability to mix and match some bizarre and delicious food combos. There were a number of other dishes including a plain rice, lamb and lentil option that I didn’t sample but as far as a selection of mains went I thought Mishtidesh offered a good mixture and there was something for every taste. I enjoyed my mains much more than my starter plate, the chicken and keema in particular were very enjoyable, the fish was tender and delicate. My only critisism of the latter was the number of bones but thats a minor quibble in the grand scheme of things. The variety of flavours on the plate definitely packed a punch and there was a distinct spicy taste to the overall mix of dishes on my plate. The views around the table varied dramatically. Whilst I thought the starters were on the average side I felt the mains delivered a good variety, some great flavour and a real spicy kick! This view was echoed by the non Bangladeshi diners. Our two Bengali heritage guests however seemed less impressed not so much at the quality of the food itself but its lack of adventure and eating out feel. The buffet variety was described by both as “typical wedding food” and “what my mum makes at home”. On a personal level when I dine out I like to eat what different cultural communities would eat and that made the Mishtidesh experience a welcome insight and journey into traditional home cooked Bangladeshi cuisine. Price wise the buffet is a bargain, at £5.50 you can’t go wrong price wise and the choice is varied enough to give you a number of different options to sample. I have no doubt the buffet will develop over time, if I was to offer advice it would be to add more variety to the starters which pale in comparison to the main courses on offer. The layout of the space and buffet area needs further consideration. The dishes almost sit one on top of another there is no room to swing a cat let along swing a serving ladle! Despite the minor grumbles I think the buffet offer definitely has potential and will improve over time. For my second review I thought I would return to my Sparkbrook roots and the famous Balti Triangle. Back in the 90’s the triangle was the place to eat, these days the Triangle is a pale shadow of its former glory. There are still a few jewels dotted around including Al Faisals and Desi Grill but some of the names from years gone by are no longer with us. Ladypool Road continues to carry the banner for the Balti Traingle but the Stratford Road in the last decade has lost institutions like the Royal Naim, Sher Khan and the Grand Tandoori amongst others. For my first Balti Triangle review I’ve picked one of the golden oldies the Lahore Kebab House on Ladypool Road. 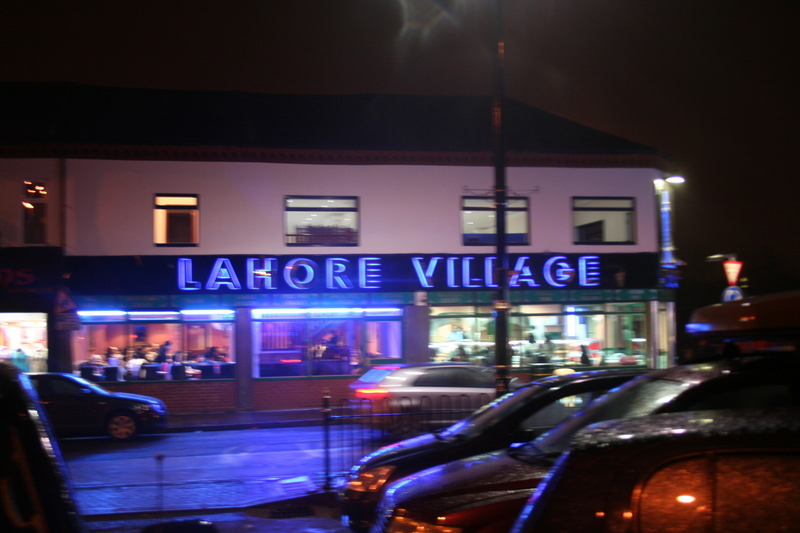 For many Brummies Lahore is an institution and a firm favourite for the city’s Pakistani community. The restaurant occupies a prime corner plot on the Ladypool Road and has bizarrely opened a second outlet across the road which is almost an identical twin of its older sibling. Walking into Lahore Kebab House is like walking back in time, the restaurant is split between a takeaway area which is the main entry point and a family dining area open to larger groups of diners. Our dining party of three opted to eat in the family dining area post Jummah prayers. The restaurant is definitely quieter in the afternoon than the evening. The first thing I noticed was Lahore has decided to replace its famous plastic covered tables with new wooden tables and big leather chairs. The chairs I liked the tables looked dated and ours had a distinct sticky feel to it…. Lahore might have upgraded its furniture and added new black signage on the outside but the interior walls remain dated and in desperate need of a face lift. Pride of place on the dated interior goes to Imran Khan paying homage to his pathan roots with a rifle in his hands and traditional Pashtun hat. Imran is joined by Lady Diana veiled by a white scarf watching over the diners at Lahore. There is also the token PIA poster! We were greeted by our waiter who was prompt in bringing over some water and dishing out some new menus which include a glaring and rather funny missing word on the back of the menu as part of the Lahore Customer Commitment! I’ll leave it to readers to go and see Lahore’s clanger for themselves. Food I hear you say! Lahore Kebab House as the name suggests is famous for its Kebabs and Grills. Whilst the restaurant serves curries and baltis I have to confess in all the time I have ever visited Lahore I have never summoned the courage to try one and lack the enthusiasm after seeing them sitting under the counter looking as appealing as a bag of brussel sprouts! For our dining option we picked Fries and Chicken Pakora as a starter followed by two classic mains of Masala Fish in Nan and a Large Kebab Roll. The starters arrived promptly, a rather small portion of fries appeared in a traditional plastic roti holder and a more generous portion of chicken pakora arrived on a plate accompanied by a rather basic salad lacking cucumber and tomato but with generous proportions of lettuce and onion! The chicken pakora was ok, not great just ok. There was as much gram coating as there was chicken. I’ve yet to find a restaurant in the whole UK that does better chicken pakoras than Mushtaq’s Sweet Centre and Lahore failed to meet the Mushtaq challenge. For our mains we had a large kebab roll and masala fish in naan. Over the years I have witnessed a shrinkage in the size of masala fish portions and kebabs. There was a time when your masala fish order and kebabs dominated the naan that they were served on. 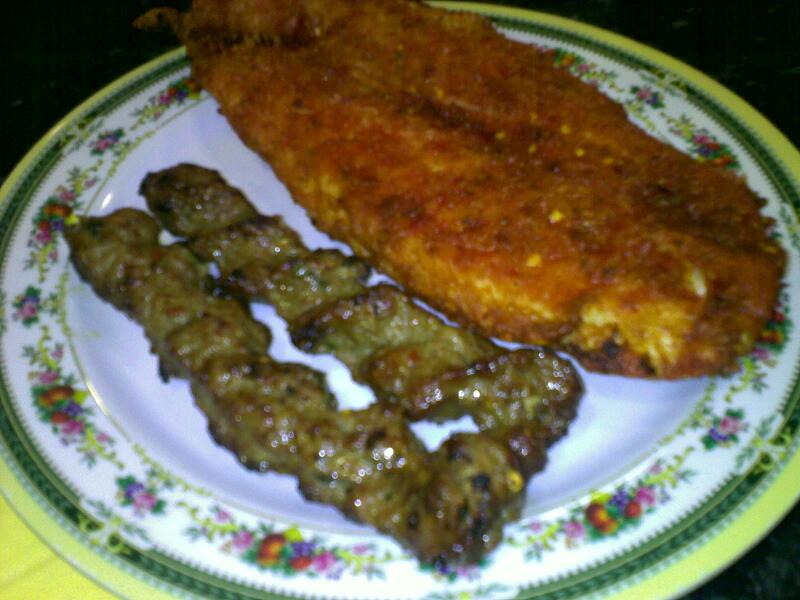 Today both the fish and the sheesh kebabs seemed to be dominated by the naan. Both dishes came with a side salad which again was missing key ingredients this time it was the cucumber but we had bonus cabbage, of the joy! The kebabs were ok, one was overcooked and resembled charcoal more than a kebab but in all fairness the other two were up to a good standard. The masala fish was slightly on the small side but well cooked and flavoured. PS the photo of the masala fish above is a classic photo from 3 years ago and was probably twice the size of the portion served today. I must remember to take a camera with me to my reviews! After years of dining at Lahore I have to confess the food didn’t set my taste buds on fire, when I eat out I expect good, today I got ok and a sense that Lahore has seen much better days and is now more a place to eat because its convenient rather than because its food is the talk of the town. There is a real need to revitalise this former jewel of the Balti Triangle, the dining area is dated and in need of a major face lift. On the positive side price wise Lahore continues to deliver good value for money and customer service was prompt and polite. If you’re in a rush and just need a kebab on the go you could do worse but if you’re looking for space to enjoy a meal out I think there are better options on the Ladypool Road including the new Desi Express further up the road. My bigger concern is that the Lahore experience today is a wider reflection on the Balti Triangle which has gone from great choice to good choice to limited choice. A couple of months ago I was on the Wilmslow Road in Manchester and it was a real eye opener to see the diversity of the food experience in Manchester compared to our balti triangle in Birmingham. As a regular eater out I find myself drawn more to Small Heath and Alum Rock than the Balti Triangle and fear the continued demise of what has been a Birmingham institution. Here is hoping further reviews of restaurants in the Balti Triangle give me more hope to be optimistic about its future. You can’t help but admire a group of enthusiastic aspiring restaurateurs wanting to open a new Arabian inspired eatery on the Coventry Road to compete with established favourites like Momos and Al Badr, even more so when the group has no experience in the restaurant game. Enter Abu Zayd the Coventry Road’s first Arab themed Grill and Steak House. For me there is no better time to judge the quality of a halal restaurant then walking in for a bite to eat in the post Friday prayer rush when the great and the good from the Muslim community spill out onto the streets from the hundreds of mosques jotted across the city to satisfy their grumbling stomachs! 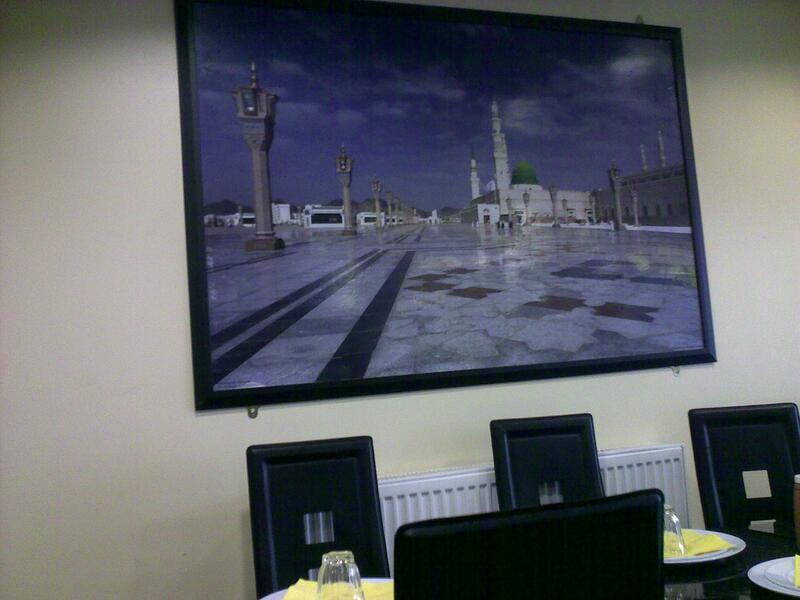 The restaurant is housed over two floors in the heart of the Muslim quarter on the Coventry Road in the Small Heath district of the city. The ground floor is dominated by male diners with a separate family area available upstairs for family and female groups. Downstairs the decor is a step up from some of its competitors, a warm mix of browns and creams. Upstairs in the family area there is a darker feel due to the lack of natural lighting and presence of partitions to provide intimacy for female and family diners. Walking in during the post Friday prayer rush its easy to feel overwhelmed and squeezed in as the main dining area is narrow and some of the space is offset by the counter and food preparation area. In peak periods its likely you will have to table share in the spirit of Wagamama whilst this is a novel and new concept for me its a welcome one and extends the spirit of community and congregation from the prayer rooms to the dining halls. Our group of three arrived later than we wanted to and we walked in to find the downstairs space full to capacity resulting in us getting a table upstairs. Any grumbles with the lighting were quickly dispelled as a seat next to the central heating providing much needed comfort from the biting cold outside. The highlight of the Abu Zayd experience is the diversity and simplicity of the menu. Beef takes prime position on the menu which is no surprise with Abu Zayd’s focus on grills and steak. From T Bone and Jerk Beef strips to the first truly Halal original Beefburger there is something to suit every taste. Equally impressive are the Salmon and Sea Bass options so often missing from ethnic Muslim menus. The menu is rounded off by a selection of chicken dishes, koftas and staple offerings of savoury rice, pasta, chunky chips and sharwama. For our visit we skipped the starters and opted to dive straight into the mains. I ordered the half Grilled Chicken. My dining partners ordered a T Bone Steak and a grilled Chicken Steak burger all accompanied by side orders of pasta, chunky chips and a generous helping of salad! I have to apologise for the lack of photos of the food, the camera on my Nokia E71 was not the best choice for dining upstairs, will try and get some photos into the entry at a later date. Abu Zayd pricing is on the money and provides excellent value. The menu is competitively priced and the portions are extremely generous. The T Bone Steak with Pasta, Chips and Salad came in at a very reasonable £8.95, the grilled chicken and steak burger with the same side dishes came in at a credit crunch beating £4.95. The service was prompt and friendly, the banter with the staff was warm and the waiter was more than happy to advise on specials and dishes worth sampling. We had hoped to try the Jerk Beef but it was unavailable and one to try on a return visit. So how was the food I hear you cry! My plate arrived overflowing with chicken, pasta, chunky chips and a salad accompaniment. The chicken was grilled to perfection and had the right balance in terms of flavour without being overpowering. The pasta had a sweet flavour that accompanied the earthiness of the grilled chicken, if I was to have a criticism it would be that I do prefer my pasta to have an “al dente” firmness to it but this was easily excused by the rich flavours of the pasta. The T-Bone steak looked absolutely delicious. From speaking to my fellow diner his only complaint was there was too much food on the plate! If you’re gonna opt for the T Bone Steak its definitely advisable to skip starters! The one thing missing from the Steak menu is an accompanying gravy or sauce that is so often a staple part of the offer in other restaurants. I’d love to see a traditional gravy option or a mushroom or pepper sauce to compliment the steak menu and add a different flavour dimension to the dishes on offer. 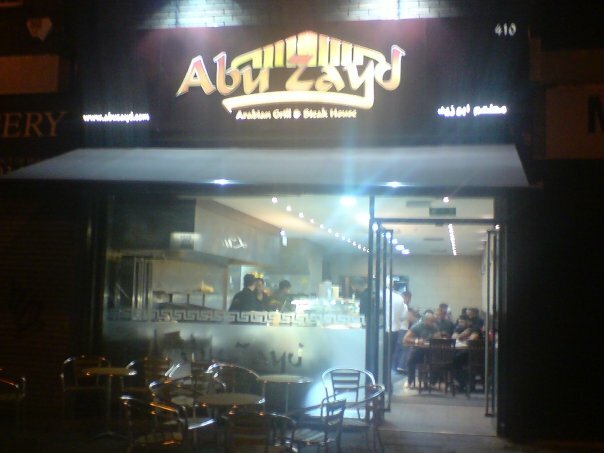 Abu Zayd has been open now for a number of months and there is a consistency to both the quality of the food and the standard of service that is so often lacking in some of the competing restaurants on the Coventry Road. Prices are competitive and make Abu Zayd the perfect choice for evening meals and lunch time gatherings. Portions are extremely generous and if there is to be a criticism the size of the portions can stop you from sampling some of the starter and dessert options. The diversity of the menu and the quality of both the food and service makes Abu Zayd a restaurant you are very likely to revisit. I’m yet to try the grilled sea bass and still want to try the jerk beef strips. Abu Zayd is a welcome addition to the growing dining options on the Coventry Road and the latest in an increasing number of Arab restaurants in the Small Heath area that could do for Small Heath what the Balti triangle has done for Sparkbrook.